In this modern World Wide Web you would have noticed that Bookmarking feature is almost dead. We generally tend to search on Google for websites rather than going back and browsing our Bookmarks most of the time. However when you are browsing on the web and see something wonderful which can be referred by you in the near future then you will have to save it or rather say bookmark it. People generally follow several methods to save the bookmarks and we all know that web based bookmark services need a bookmarklet or an extension to save desired WebPages. However with advent in technology there are so many web applications or tools being developed for bookmarking as saving bookmarks directly into the web browser does not seem to be that easy these days unless you are making use of the same web browser on your phone and on your PC. So as to ensure that we do not lose bookmarks across various devices we have a solution and that is the Saved.io tool. This tool does not require any kind of extensions and can be used easily without any hassle in any web browser. The first thing that you need to do so as to make use of the Saved.io tool is create an account on their website http://www.saved.io with a valid username and password. After creating an account there you can easily save the web page address any time just by visiting the webpage in your normal web browser and display the page on your PC screen. You have to enter “saved.io/” excluding the double quotes before the URL of the web page in the web browser and then press enter. After this you will redirected to the webpage where you will be able to see the saved link. Isn’t it simple and easy? One can as well create lists of bookmarks just by giving the name of the list before the “saved.io/” address. For example if you would like to add a website to your list of genealogy websites in that case you must enter “genealogy.saved.io/” just before the URL of the web page in your web browser and hit ENTER. This way we can create as many numbers of lists as possible. If you are making use of more than one web browser or more than one PC in that case you must log onto Saved.io at least once in each system. 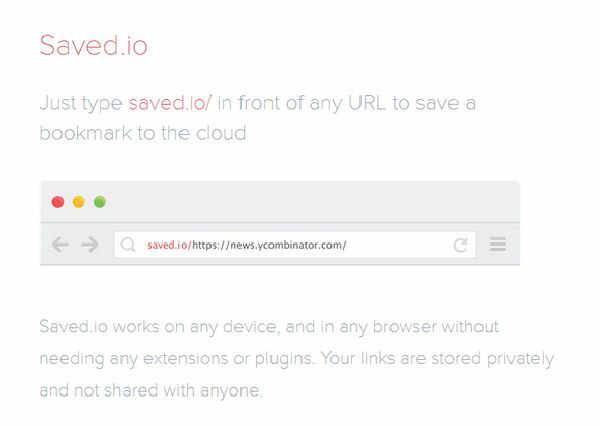 The Saved.io website will save a cookie in your web browser and after that it will by default identify in the future and remember you need to save your bookmarks in the right account on Saved.io.